Heey guys today I thought I would share with you some of the blogs that I read, that are all written by teenagers! 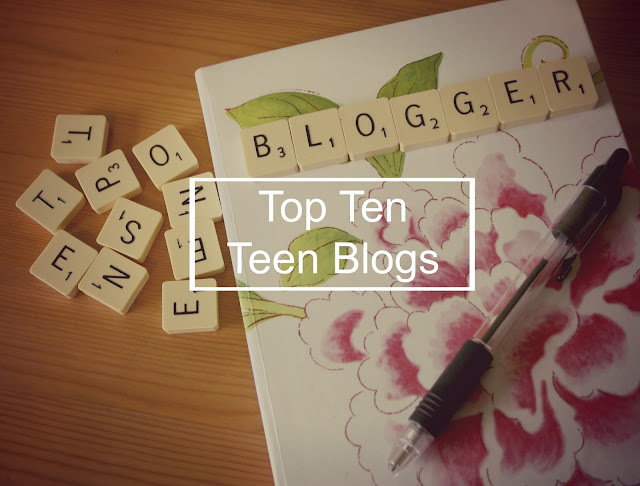 I feel like sometimes people will shun teenage blogs, as they think that teen bloggers aren't as experienced, mature or literate, but hopefully by seeing these blogs, people will see how great teen blogs are! I discovered Nicole's blog Thrifty Vintage Fashion in July of this year, and I have loved every post since then! You can expect to find a lot of advice, blogging tips and beauty posts on Thrifty Vintage Fashion, and I think she has such a refreshing outlook on life, which really shows through in her posts! I found Nicole's blog through Instagram, and you should definitely check it out because her photography is amazing!! I lovee Amy's blog, I think I discovered it in July as well, after reading the comments on Nicole's Instagram! You can expect to find fashion, beauty and photo blogs on Traces of my Thoughts, and I love the blog photography (especially the pictures of cosy jumpers). Amy is just such a lovely person, so you should definitely read and follow her blog! First of all any blog who has bunting as their background has got to be worth a read! I discovered Ellie's blog through Instagram and the pictures instantly drew me to her blog link! You can expect to fin predominantly beauty on her blog, but there are a few fashion and DIY posts too! I think I discovered Sophie's blog through Twitter again and I really love it! I think that the name of the blog 'Shy Life Living' is really catchy and it just makes me feel all nice and warm.. (Well that made no sense). You can expect to see posts relating to fashion, beauty, photography and advice on Sophie's blog. Oh My Valentino is one of the best blog names I've heard, it just reminds me of some high end Italian perfume company..?! I don't know, anyway this blog is run by two best friends, Alexandra and Sophie and covers predominantly beauty and fashion but also include the occasional photo blog. This blog is run by Sophie from Oh My Valentino, and was started just over 1 week ago! So far there are only two posts, but I'm predicting the forthcoming posts are going to be amazing! You can expect to see beauty and fashion posts again on this blog. I first discovered Hannah's blog through a blogger meetup I wasn't able to go to.. (I kind of followed everybody that went to it, and I'm not sure why) but I'm so glad I did otherwise I wouldn't have found Glitter Melody! Her blog contains fashion, beauty, food, music and just everything really! I would definitely suggest checking out Hannah's Instagram too, as her photography is so crisp and clean! Through the Mirror, is a blog mainly focused on beauty, fashion and tips/advice. It is run by Caitlin, who is 19, but has a writing style that makes her seem far older (in a very good way!) I love the layout of her blog and also her gold chevron notebook! I think I first found Caitlin's blog on Twitter and then on Instagram! Little Ellie Mae is predominantly a fashion and beauty blog, which features many lush products... Probably why I love it! I found Ellie's blog through Twitter, where she invited me to a blogger event, which unfortunately I couldn't attend (it's the one I previously mentioned if you haven't guessed). I love her blog because it is such a happy space, and provides me with great fashion tips, especially on her American Haul post! So that's it for today guys, I was going to do a baking post, but I didn't bake the cupcakes yet! I will be baking them on Sunday, so I should hopefully post them soon? Also please let me know what posts you would like to see me do around Christmas time, as I really would like your opinions! This is such a lovely post! I'm glad you enjoy reading my blog and thank you so much for your kind words! This is a great way to discover new blogs so thank you for your recommendations! Also, I really love your blog too! Thanks so much for the mention! It means a lot!!! !